VesuvanDoppelbanger on You know what that also is?... An artifact! I'm working out my own version of liquidmetal abuse, and it's likely to be a lot like this. I think Artifact Mutation fits right in pretty well. Wahoo! Biggest ones I have to suggest: Jade Mage and Reassembling Skeleton. They're monsters. 2 mana for 1 sacrifice? Yes, PLEASE! Ant Queen is also good, similar, and a bigger body. However if that is not enough- which I'll assume it's not- Artifact Mutation is freaking delicious. Bitterblossom is a staple. Creakwood Liege also pumps the majority of your deck. Daretti, Ingenious Iconoclast is also decent removal and his ult is insane. Descent of the Dragons could be an alternate wincon. Dragonlair Spider looks like garbage but can get out of hand in a hurry. Druid's Call is honestly insane, it's a great deterrent for blockers. Elemental Mastery is the best. Feral Incarnation, because it has convoke, is not so bad either. Necrogenesis is classic. Ogre Slumlord is a baller and a great rattlesnake. Plague of Vermin is a really nice way to put some damage in on your opponents, especially if the political atmosphere is good. Rampaging Baloths is craaazy. Sprouting Thrinax has served me well. Sylvan Offering can make some friends AND some tokens. Verdant Embrace and Verdant Force are good. Wolfcaller's Howl is good I think? Here is a few cards you could consider for this deck. Artifact Mutation, Haunted Cloak, Sword of Vengeance, Lightning Greaves, Xenagos, God of Revels, Huntmaster of the Fells Flip, Mina and Denn, Wildborn, and Reclamation Sage. I find that the Equipment package would be the most effective. After all your commander really wants to have Haste and Trample, so it can swing right away, and put all of that power to good use. Because if you're attacking with it you only need to deal 21 damage, but Fling effects won't deal commander damage, and thus will require you to reduce their health to 0. In most cases that will be 19 more damage required. Both the Cloak and the Sword give both of these abilities, while the greaves offers Haste and protection, and Xenagos gives haste and makes commander twice as big. @deakmana, Thanks for the comments! Its cool to get some comments from an actual competitive perspective. 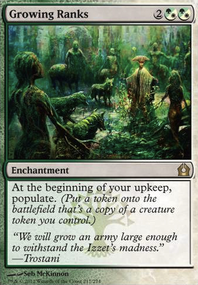 Re: Crop Rotation : The card disadvantage is real; and it might not be obvious from just reading this list, but it doesn't really need Gaea's Cradle, it's just sort of nice to have. Most of the time you want a Blood Moon effect anyway, so the Cradle gets turned off (and Scavenger Grounds, and Spinerock Knoll). Although Boseiju, Who Shelters All is an interesting suggestion. Spinerock Knoll has been good so far. It's a nice way to get more gas at a pretty minimal cost; in many cases it doesn't even cost a card. I'm never sad to see a one-sided wipe. Literally every competitive deck except maybe Jeleva and Teferi have creatures in play. I'm not sure if you've played any competitive EDH in the last 18 months, but there's these two commanders called Thrasios and Tymna... And those decks tend to be loaded with creatures. 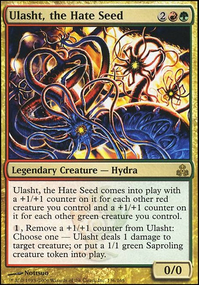 It's sort of a bummer that most decks actually do have a few creatures in play, frequently with stats like 1/3 or 2/2, which makes it hard to get clean attacks with the hatebears. 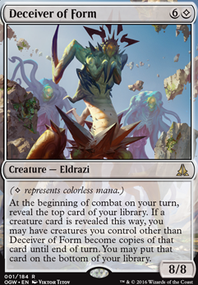 Ezuri's Predation is just about as easy to cast as Mizzium Mortars, and is vastly superior. 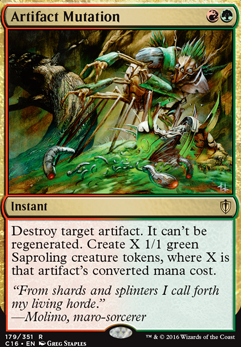 Not only is it disruption and mana destruction, it's nearly a game-ending threat! re: Gamble. I tried this and cut it quickly. If you want to use it to get something you're not going to discard, then you have to do it off your opening 7. That means you're spending turn 1 playing gamble instead of a mana elf, which is just terrible. Or your spending turn 2 playing gable instead of a stax piece, which is also terrible. Then if you want to play it turn 3, you've got 3 cards left in hand. One of the benefits of this deck is that it doesn't use the graveyard... so if the tutor target gets discarded it's gone for good. In a lot of decks Gamble is good because it's a second copy of Entomb. As you can see, the opposite is true here. Incidentally, Chrome Mox has a similar problem: basically its likely that you don't have enough spare cards to come back from the card disadvantage. The general doesn't provide card advantage, so we're not reliably ramping into something that refills the hand. I've tried Orcish Lumberjack. It's really bad to play a turn 1 dork that might not actually make mana, which happens, if you don't have a forest. It can be strong tho. Perhaps its worth using. Have you tested it in this list? Re: By Force. Could you talk about why By Force would be superior in this list to Artifact Mutation, Vandalblast, Reclamation Sage, Bane of Progress, Release the Gremlins, and Caustic Wasps? I've also tried and cut Skullclamp. It's just slow and not good. I don't have a reliable 1-toughness token producer (like in a Tana, the Bloodsower deck), and basically token-making isn't a great route to victory. It doesn't draw off commanders and the only thing that leaves is using it to draw off mana elves after the mid-game when you don't need the mana anymore. That's just not a winning plan, anyway. Root Maze, Hall of Gemstone, Imperial Recruiter, and City of Traitors are all decent suggestions, Worth considering! Have you tried any of them in this list, or a similar one?